Impossible as it is to circle and crop the man's back catalogue to 20, 30, 70 songs, this is a damn good attempt at compiling some of the best of Stevie's work. The man is a living genius who will be long remembered when gone due to the universal and positive vibrations within his songs. Most likely a digital remaster but it sounds great! Clean flat pressing. Dynamic with a nice full sound and at a decent price! wonderful sounding reissue and pressing is quiet. well done. good to finally have the super funky 10 min Do I Do. I have a copy Spain edition, but some differences in did. My version has the tracks in a totally different order from on the sleeve with "I wish " " isn't she lovely" and " do I do " on side b first album ? Even though this is sort of a greatest hit record, I still qualify this as an album. It has all the great hits from the '70's (Stevie's golden period), and adds 4 great new songs (That Girl, Ribbon In The Sky, Front Line, and the 10 minute Do I Do). I say that this reminds me of an album, because it has that album feel, where all of the songs are weaved together (the genius of how Stevie produces). 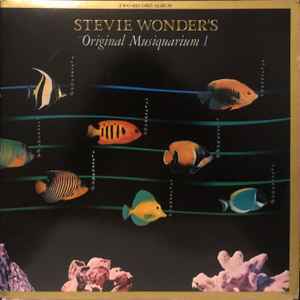 This would be considered the last classic album by Stevie, even though he was still very capable of making hit after hit. Well, the Album Revolution is over!